Sixteen dividends received, but February income was down. Eight dividend increases were announced. Four sells and three purchases. 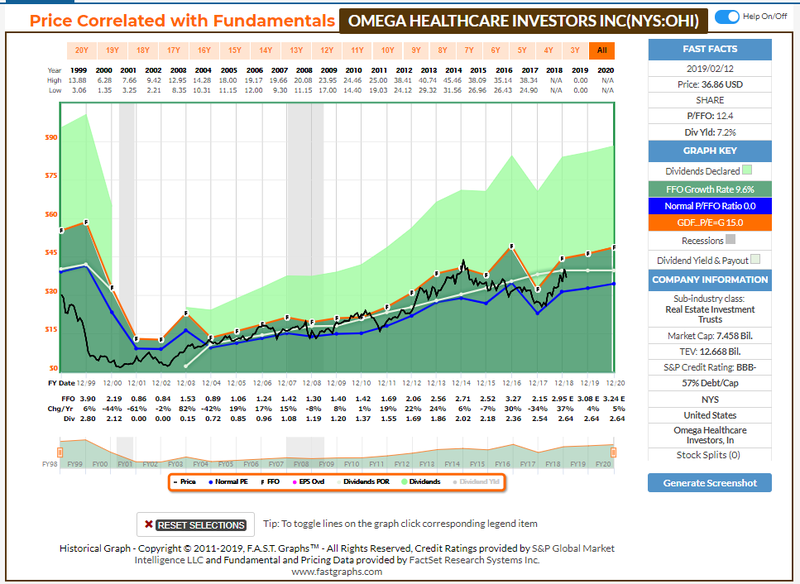 Omega Healthcare Investors sold as negatives mount. The Motorhome Period plan is a month ahead of schedule. From age 54 to 59.5, we will not yet be able to withdraw from IRAs and will not have social security income. During this critical time period, income will be limited to cash savings and income from a small portfolio. We will spend all or part of this time traveling the country in our motorhome. I call this the Motorhome Period. From age 59.5 to 62, we can withdraw from IRAs but will not have social security income. From age 62 and older, we can withdraw from IRAs and will have social security income. During this potentially long time period, the plan must be more dynamic as we respond to market conditions. First, I will update the totality of the holdings, and later, the progress on the Motorhome Period plan will be updated. 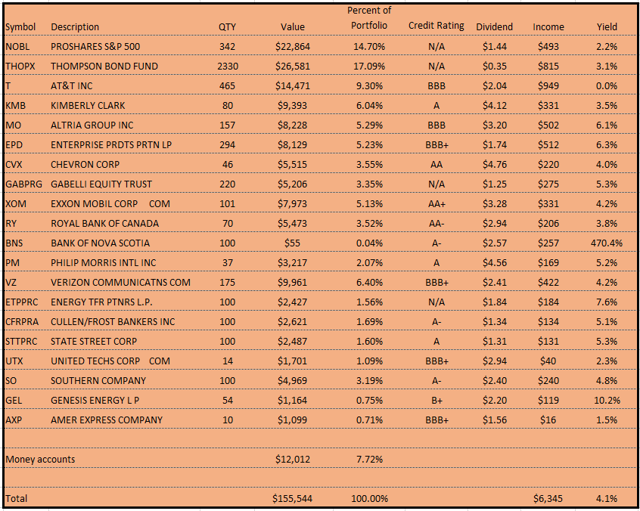 There were 16 companies or funds that paid dividends. 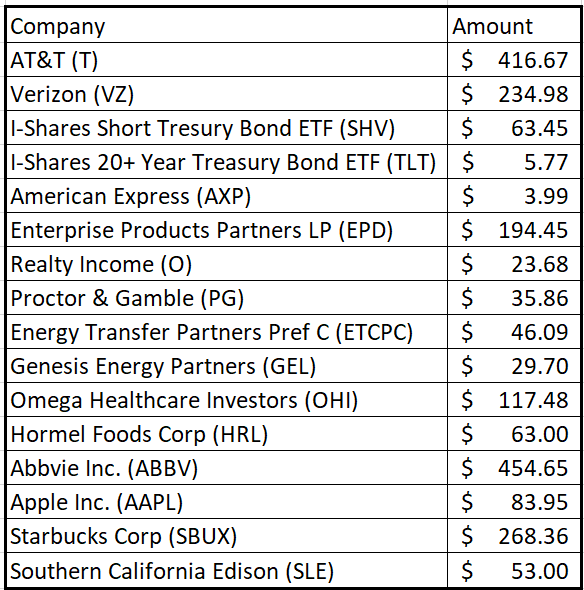 Dividend income was $2,095.08, which is a decrease of 6% from February 2018. This is due to the sale of TransMontaigne Partners LP (TLP) after the announcement in December that is was being acquired. There were eight dividend increases. The amounts shown in the table below are the quarterly figures. 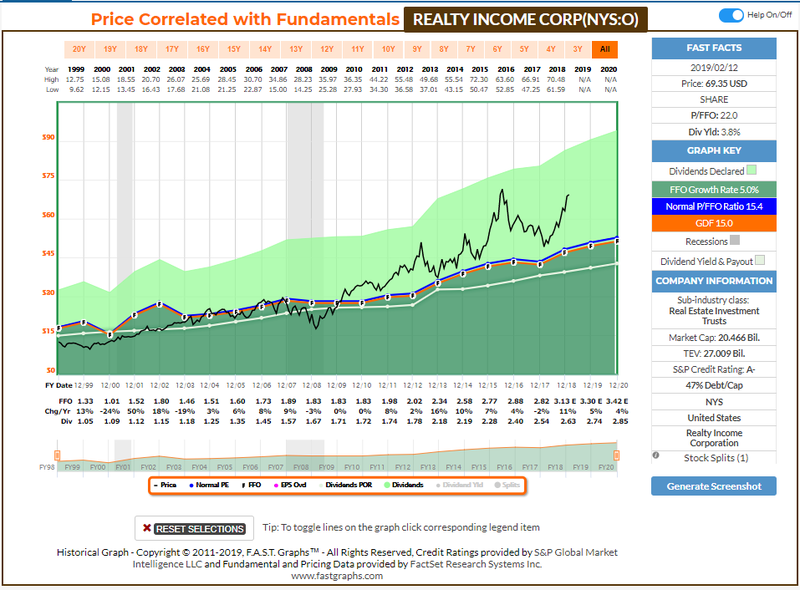 Realty Income had become overvalued. Below is the F.A.S.T. Graphs chart showing the high valuation. The P/FFO had reached 22 vs. a normal P/FFO of 15.4, and the yield had dropped to 3.8%. We like the company. This was simply a valuation sell. The GrayBeard Retirement dividend discount value calculation determines the value to be in the $49-55 range. At almost $70, the overvaluation was too large to ignore. Should the price become reasonable, I will likely own it again. 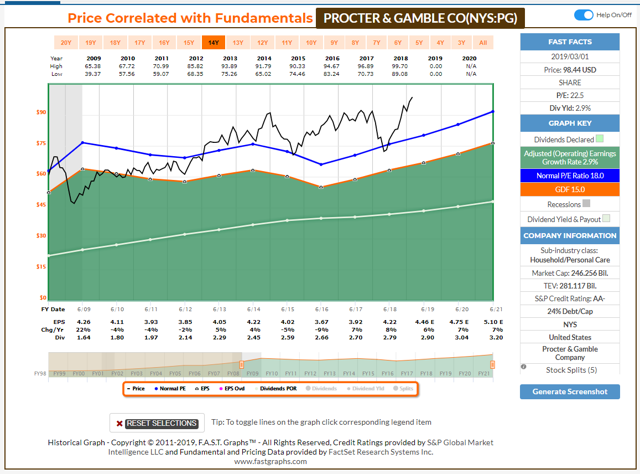 Procter & Gamble had become overvalued as well and was sold. This is graphically depicted in the F.A.S.T. Graphs chart below. The P/E has reached 22.5 against a normal P/E of 18. Each time the P/E has run up to the 22-24 range, the stock has fallen back. The GrayBeard Retirement dividend discount value calculation determines the value to be in the $80-85 range. At almost $100, the overvaluation was too large to ignore, especially given the history of retracting from P/E levels seen currently. Just as with Realty Income above, should the price become reasonable, I will likely own it again. Omega Healthcare Investors was sold. It had reached fair value as seen below in the F.A.S.T. Graphs chart below. Over the past several years, OHI has been bouncing from about 12 P/FFO (blue line) and 15 P/FFO (orange line). Additionally, it appears more troubles could be brewing, as it was revealed in the 4Q conference call that another tenant, a top ten tenant no less, was having difficulty making rent. This particular tenant does business in Texas, which has some of the lowest Medicaid reimbursement rates in the county. OHI has other exposure to Texas as well. Additionally, it is acquiring MedEquities Realty Trust (MRT). MRT also has significant exposure in Texas, which could further exacerbate the problem for OHI. There has been an ongoing debate between Seeking Alpha contributors Brad Thomas and Trapping Value regarding the safety of the dividend, with Brad asserting it’s safe and Trapping Value otherwise. Early in 2018, when the price was near the low end of the range, I decided on the side of Brad and determined that the risk was worth taking in owning the stock. In a recent article, TP seems to be sounding the alarm on OHI considering the tenant troubles and what he considers to be a precariously covered distribution. Now at the top end of the range and trouble with another tenant, I side with TP and think the risk is no longer worth taking. It is interesting to note that even though Brad is still positive and thinks the dividend is adequately covered, he stated in the comment stream of his article that he has reduced his position. Indeed, 2018 was a good price performance year for OHI after rising almost 40% in the thirteen months prior to 1/31/19. After that run-up, I felt like it was a good time to take a profit. An additional factor that played into this particular decision is the OHI credit rating is BBB- and I am working to improve the credit ratings of our holdings. Therefore, I decided to agree with both of them and sold all our holdings and reinvest the proceeds into faster-growing and more creditworthy companies. It was announced that another tenant is having trouble paying rent. Current exposure to Texas, which has low Medicaid reimbursement rates. Pending acquisition of MRT, which will increase the exposure in Texas. Trading at the high end of the recent P/FFO range. Desire to improve the creditworthiness of our portfolio. The recent run-up of almost 40%. Whirlpool was purchased with the sale in mind. It was extremely undervalued when I bought it. I wrote this article that explains my thought process. I bought in October at a little less than $106. I calculated a DCF of about $155-$175 based on then current earnings estimates. I also calculated a recession case DCF of $135-150. The stock ran from $106 to around $145 in just under 5 months. Because it was at or nearing fair value and I never intended to hold it long term, it was sold. I may have left some money on the table, but the risk/reward ratio was not there as it was at less than $110-115. The valuation plays I make seldom work out in such a short period of time. I am extremely fortunate in the case of WHR that I caught it just before the run-up. RY was the first stock added to the GrayBeard Retirement Grade "A" Retirement Portfolio. I wrote a concept introductory article and analyzed RY for admission to the portfolio here. I added to our RY holdings this month as I continued to scale into our position. Its credit rating is better than A- (AA-). Its yield is greater than 2.9% (3.8%). The market capitalization is greater than $5 billion. Its dividends have a track record of growth and are well-covered. The volatility is lower than the S&P 500. Additionally, the company is conservatively financed, has a strategy for growth and capital to execute without deteriorating credit quality, and operates in a favorable business environment. I took a look at UPS for admission into the Grade "A" Retirement Portfolio in here. I decided that UPS did not meet the stringent requirements of the portfolio due to its volatility. It is a great dividend growth stock nonetheless. Therefore, we made this purchase outside of the portfolio. Its credit rating is better than A- (A+). The yield is greater than 2.9% (3.6%). Its market capitalization is greater than $5 billion ($93 billion). Its dividend growth is acceptable at 7-8% long term average. The dividend safety is acceptable, as the last two recessions saw freezes but no cuts since the IPO. It is a terrific dividend growth investment; averaging dividend increases around 8% for the last ten years with no dividend cuts since the IPO - a trend I think is likely to continue. This is a low-cost producer in a business that will benefit from the e-commerce macro trends, and it is investing in the infrastructure to make sure the company ready for growth. BNS was admitted to the Grade "A" Retirement Portfolio, and we purchased shares in February. The yield is greater than 2.9% (4.5%). Its market capitalization is greater than $5 billion ($69 billion). Its dividend growth is acceptable at 6-7% long-term average. The last recession saw a dividend freeze but no cut. The payout ratio is about 46%, mid-range of management's target of 40-50%. Its volatility over the last year is more of a buying opportunity than an inherent problem, because the long-term volatility is low. It is priced at fair value, probably a little lower. Also, BNS is known as Canada’s international bank. The company is taking steps to revamp its international portfolio by selling non-core assets and focusing on key growth areas. This gives it opportunities for more growth than other Canadian banks. It is conservatively financed and operates in a friendly Canadian regulatory environment for 56% of its revenues. From age 54 to 59.5, we will not yet be able to withdraw from IRAs and will not have social security income. During this critical time period, income will be limited to cash savings and income from a small portfolio. We will spend all or part of this time traveling the country in our motorhome. I call this the Motorhome Period. This time frame has its own plan. You can read about it here. The discussion of the Motorhome plan starts about one-third the way through the article. 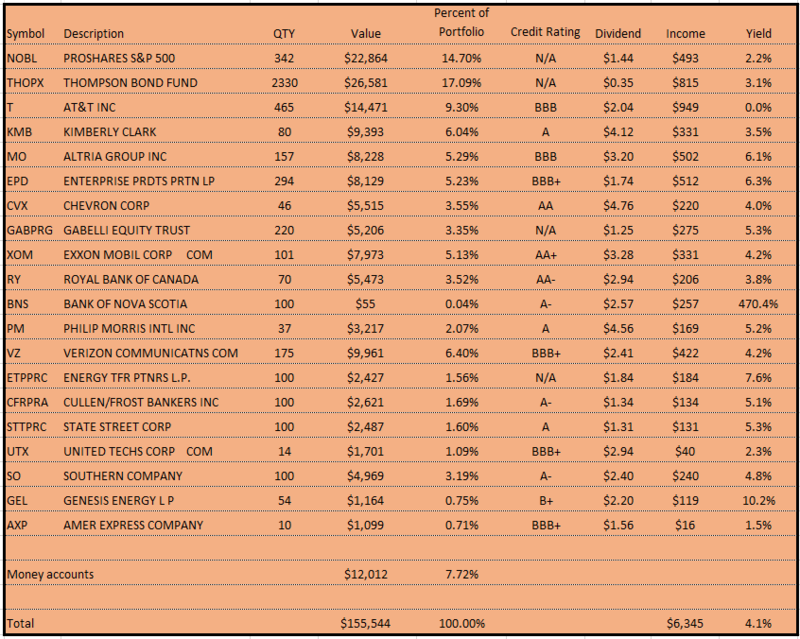 The annualized income in this account decreased from $6,440 last month to $6,345 due to sales of overvalued stocks. This income will be used with cash savings to fund the Motorhome Period. The plan calls for the annual income from this account to be about $7,700 by the time we retire, but I would like for it to be closer to $10,000. 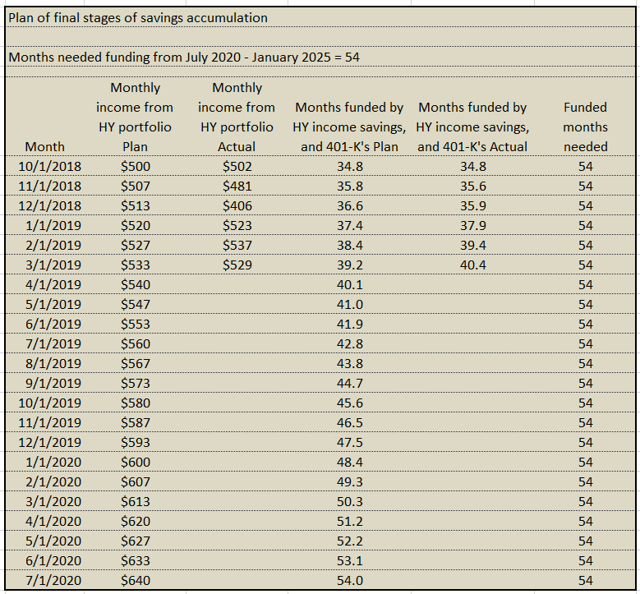 I created the following table to track the progress of the plan. Included in the cash savings are the 401(k) accounts, as we will withdraw our 401(k) accounts penalty-free the year we turn 55. You can read about our plan for avoiding the penalty here. The description starts a few paragraphs into the article. The table shows that income is on plan, but the total months of retirement funded is one month ahead of plan due to some additional savings and an unexpected employer match in my 401(k). For those of you who have been following along previously, I plan to do updates of the permanent portfolio only quarterly going forward. If you enjoyed this article and wish to receive updates on our latest research, click "Follow" next to GrayBeard Retirement at the top of this article. Disclosure: I am/we are long RY, BNS, UPS. I wrote this article myself, and it expresses my own opinions. I am not receiving compensation for it (other than from Seeking Alpha). I have no business relationship with any company whose stock is mentioned in this article.